The KH-11 KENNEN, renamed CRYSTAL in 1982 and according to leaked NRO budget documentation in 2012 referred to by the codename Evolved Enhanced CRYSTAL (EECS) (but also referenced by the codenames 1010, and "Key Hole"), is a type of reconnaissance satellite first launched by the American National Reconnaissance Office in December 1976. Manufactured by Lockheed in Sunnyvale, California, the KH-11 was the first American spy satellite to use electro-optical digital imaging, and create a real-time optical observation capability. Later KH-11 satellites have been referred to by outside observers as KH-11B or KH-12, and by the names "Advanced KENNEN", "Improved Crystal" and "Ikon". Official budget documents refer to the latest generation of Electro-Optical satellites as Evolved Enhanced CRYSTAL System. The Key Hole series was officially discontinued in favor of a random numbering scheme after repeated public references to KH-7 Gambit, KH-8 Gambit-3, KH-9 Hexagon, and KH-11 satellites. KH-11 satellites are believed to have been the source of some imagery of the Soviet Union and China made public in 1997, as well as images of Sudan and Afghanistan made public in 1998 that were related to the response to the 1998 U.S. embassy bombings. The Film Read-Out GAMBIT (FROG) served as NRO Program A's competitor to NRO Program B's initial electro-optical imagery (EOI) satellite. After a precursor EOI study with the codeword Zoster, President Nixon on 23 September 1971 approved the development of an EOI satellite under the initial codeword Zaman. In November 1971, this codeword was replaced by Kennen. Data is transmitted through a network of communications satellites; the Satellite Data System. The initial ground station for the processing of the electro-optical imaging was a secret National Reconnaissance Office facility in Area 58, located in the continental United States according to the NRO, and more precisely in Fort Belvoir according to other sources. In 1999, NRO selected Boeing as the prime contractor for the Future Imagery Architecture (FIA) program, aimed at replacing the KH-11 satellites by a more cost effective constellation of smaller, and also more capable reconnaissance satellites. After the failure of the FIA in 2005, NRO ordered from Lockheed two additional legacy hardware KH-11s. USA-224, the first of these two, was launched in early 2011 two years ahead of the initial schedule estimate. In January 2011 NRO offered NASA two space optical systems with 2.4 m diameter primary mirrors, similar to the Hubble Space Telescope, yet with steerable secondary mirrors and shorter focal length resulting in a wider field of view. These could either be spare hardware from the KH-11 program, or optics from the cancelled FIA program. The satellites were reportedly stored in a clean room facility at ITT Exelis in Rochester, NY. KH-11s are believed to resemble the Hubble Space Telescope in size and shape, as the satellites were shipped in similar containers. Their length is believed to be 19.5 meters, with a diameter of up to 3 meters. A NASA history of the Hubble, in discussing the reasons for switching from a 3-meter main mirror to a 2.4-meter design, states: "In addition, changing to a 2.4-meter mirror would lessen fabrication costs by using manufacturing technologies developed for military spy satellites." Different versions of the KH-11 vary in mass. Early KH-11s were reported to be comparable in mass to the KH-9 Hexagon, i.e. about 12,000 kg. Later blocks are believed to have a mass of around 17,000 kg to 19,600 kg. It has been reported that KH-11s are equipped with a hydrazine-powered propulsion system for orbital adjustments. In order to increase the orbital lifetime of KH-11s, plans existed for refuelling the propulsion module during service visits by the Space Shuttle. It has been speculated that the propulsion module is related to Lockheed's Satellite Support Bus (SSB), which had been derived from the Satellite Control Section (SCS) developed by Lockheed for KH-9. A CIA history states that the primary mirror on the first KH-11s measured 2.34 meters, but sizes increased in later versions. NRO led the development of a computer controlled mirror polishing technique, which was subsequently also used for the polishing of the primary mirror of the Hubble Space Telescope. Later satellites had larger mirrors, with a diameter of around 2.9–3.1 m. Jane's Defence Weekly indicates that the secondary mirror in the Cassegrain reflecting telescope system could be moved, allowing images to be taken from angles unusual for a satellite. Also, there are indications that the satellite can take images every five seconds. The initial KH-11 camera system offered frame and strip modes. KH-11 Block II might have been the first reconnaissance satellite equipped for imaging with a 800 x 800 pixels charge-coupled device (CCD). Later block satellites may include signals intelligence capabilities and greater sensitivity in broader light spectrums (probably into infrared). Communication to and data downloads from KH-11 satellites are routed through a constellation of communication relay satellites in higher orbits. The initial communications relay payload is believed to have operated at a frequency of 60 GHz, as radio emission at this frequency is blocked by Earth's atmosphere, and thus not detectable from the ground. Launch of the initial two Satellite Data System satellites occurred in June and August 1976, i.e. ahead of the first launch of a KH-11 satellite in late 1976. A perfect 2.4-meter mirror observing in the visual (i.e. at a wavelength of 500 nm) has a diffraction limited resolution of around 0.05 arcsec, which from an orbital altitude of 250 km corresponds to a ground sample distance of 0.06 m (6 cm, 2.4 inches). Operational resolution should be worse due to effects of the atmospheric turbulence. Astronomer Clifford Stoll estimates that such a telescope could resolve up to "a couple inches. Not quite good enough to recognize a face". When NRO donated two Optical Telescope Assemblies (OTA) to NASA in January 2011, they were suspected to be KH-11 series "extra hardware", but were later attributed to the Future Imaging Architecture program. The donated OTAs feature a three-mirror anastigmat (TMA) optical design, without the tertiary mirror. The f/1.2 primary has a diameter of 2.4 m, and is refocused by the secondary to give an overall f/8 focal ratio, making the optical telescope assembly shorter than that of HST. With the addition of the tertiary mirror, this will produce a much wider field than Hubble's 2-mirror f/24 Ritchey–Chrétien optical design, making it a potentially ideal observatory for dark energy or other astrophysics surveys. 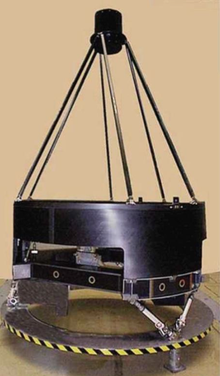 The secondary mirror is mounted on a hexapod to increase the side-viewing and ground scanning ability for the originally intended reconnaissance mission. Block I refers to the original KH-11 satellite, of which five were launched between 19 December 1976 and 17 November 1982. The three Block II satellites are in the open literature referred to as KH-11B, the alleged DRAGON codename, or Crystal, and are believed to be capable of taking infrared images in addition to optical observations. The first or second Block II satellite was lost in a launch failure. Four Block III satellites, commonly called KH-12 or Improved Crystal were launched between November 1992 and October 2001. The name "Improved Crystal" refers to the "Improved Metric CRYSTAL System" (IMCS), which adds reference markings for accurate mapping to images obtained by the satellite. Another improvement was an eightfold increase in the download rate compared to earlier models to facilitate improved real-time access and increased area coverage. From Block III on, the typical lifetime of the satellites increased to about 15 years, possibly related to a higher lift-off mass, which facilitates larger fuel reserves for countering atmospheric drag. Three electro-optical satellites launched in October 2005, January 2011, and August 2013 are attributed to Block IV. A new generation of clandestine communications satellites launched to inclined geosynchronous orbits have led to speculations that these are in support of Block V electro-optical satellites scheduled for launch in late 2018 (NROL-71) and 2020 (NROL-82). The two satellites have been built by Lockheed Martin Space Systems, have a primary mirror with a diameter of 2.4m, and are evolutionary upgrades to the previous blocks built by Lockheed. Based on the published hazard areas for the launch, an orbital inclination of 74 deg has been deduced for NROL-71. This could indicate that NROL-71 is targeted for a Type II Multi Sun-Synchronous Orbit, which would enable the satellite to study the ground at a range of local hour effects (shadow direction and length, daily activities, etc.). The Misty satellite is believed to have been derived from the KH-11, but modified to make it invisible to radar, and hard to detect visually. The first Misty satellite, USA-53, was released by the Space Shuttle Atlantis on mission STS-36. 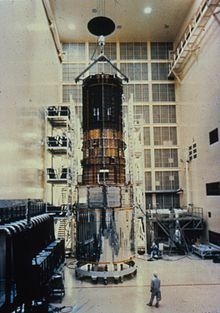 The USA-144 satellite, launched on 22 May 1999 by a Titan IVB from Vandenberg Air Force Base may have been a second Misty satellite, or an Enhanced Imaging System spacecraft. The satellites are sometimes identified as KH-12s. KH-11 image of the construction of a Kiev-class aircraft carrier, as published by Jane's in 1984. In 1978, a young CIA employee named William Kampiles was accused of selling a KH-11 System Technical Manual describing design and operation to the Soviets. Kampiles was convicted of espionage and initially sentenced to 40 years in prison. Later, this term was reduced, and after serving 18 years, Kampiles was released in 1996. In 1984 Samuel Loring Morison, an intelligence analyst at the Naval Intelligence Support Center, forwarded three classified images taken by KH-11 to the publication Jane's Fighting Ships. In 1985, Morison was convicted in Federal Court on two counts of espionage and two counts of theft of government property, and was sentenced to two years in prison. He was pardoned by President Clinton in 2001. Nine KH-11 satellites were launched between 1976 and 1990 aboard Titan-3D and -34D rockets, with one launch failure. For the following five satellite launches between 1992 and 2005, a Titan IV launch vehicle was used. The two most recent launches in 2011 and 2013 were carried out by Delta IV Heavy rockets. The KH-11 replaced the KH-9 film return satellite, among others, the last of which was lost in a liftoff explosion in 1986. 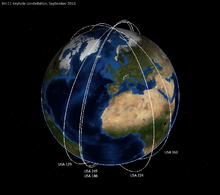 All KH-11 satellites launched between 1976 and 2013 are in either of two standard planes in Sun-synchronous orbits. As shadows help to discern ground features, satellites in a standard plane east of a noon/midnight orbit observe the ground at local afternoon hours, while satellites in a western plane observe the ground at local morning hours. Historically launches have therefore been timed to occur either about two hours before or one hour after local noon (or midnight), respectively. The orbits are such that ground-tracks repeat after a certain number of days, currently each four days for the primary satellites in the East and West orbital plane. The constellation consists of two primary and two secondary satellites (one primary and one secondary per plane). The orbital planes of the two primary satellites in the East and West plane are separated by 48 to 50 degrees. The orbital plane of the secondary satellite in the East plane is located 20 degrees to the east of the primary satellite, while the orbital plane of the secondary satellite in the West plane is located 10 degrees to the west of the primary satellite. KH-11 satellites require periodic reboosts to counter atmospheric drag, or to adjust their ground track to surveillance requirements. Based on data collected by amateur observers, the following orbital characteristics of OPS 5705 were calculated by amateur skywatcher Ted Molczan. On 4 September 2010, amateur astrophotographer Ralf Vandebergh took some pictures of a KH-11 (USA-129) satellite from the ground. The pictures, despite being taken with a 10-inch aperture telescope from a range of 336 kilometers, show major details such as dishes and solar panels, as well as some elements whose function is not known. Estimated unit costs, including launch and in 1990 dollars, range from US$1.25 to 1.75 billion (inflation adjusted US$2.40 to 3.36 billion in 2018). According to Senator Kit Bond initial budget estimates for each of the two legacy KH-11 satellites ordered from Lockheed in 2005 were higher than for the latest Nimitz-class aircraft carrier (CVN-77) with its projected procurement cost of US$6.35 billion as of May 2005. In 2011, after the launch of USA-224, DNRO Bruce Carlson announced that the procurement cost for the satellite had been US$2 billion under the initial budget estimate, which would put it at about US$4.4 billion (inflation adjusted US$4.90 billion in 2018). In April 2014, the NRO assigned a "(...) worth more than $5 billion (...)" to the final two legacy KH-11 satellites. KH-11 image of a Xian H-6 jet bomber operated by China. ^ "Develop Acquire Launch Operate (NRO Brochure)" (PDF). NRO. 22 March 2016. Archived from the original (PDF) on 26 January 2017. Retrieved 24 April 2016. ^ Day, Dwayne A. (30 January 2012). "The geometry of shadows". The Space Review. ^ Casey, William J. (18 January 1982). "Letter to Honorable Edward P. Boland from William J. Casey proposing visit by permanent select committee members to KENNEN Ground Station, CIA-RDP83M00914R000700040112-1". CIA. ^ "Briefing of Bill Woodruff and Ralph Preston, Senate and House appropriations committee staff, on KENNEN, CIA-RDP74B00415R000100010065-5". CIA. 15 August 1972. ^ a b Clapper, James R. (February 2012). "FY 2013 Congressional Budget Justification, Volume 1, National Intelligence Program Summary, Resource Exhibit No. 13" (PDF). DNI. ^ "NRO Satellites". Jonathan McDowall. 30 August 2013. ^ "SOVIET MILITARY CAPABILITIES AND INTENTIONS IN SPACE (NIE 11-1-80)" (PDF). Central Intelligence Agency. 8 June 1980. p. 2. Retrieved 2 June 2010. ^ Jeffrey T. Richelson (1990). America's Secret Eyes in Space: The U.S. Keyhole Spy Satellite Program. Harper & Row. p. 231. ^ National Reconnaissance Office. GAMBIT and HEXAGON Programmatic Declassification Guidance. 23 June 2011. Released by NRO on 7 March 2012. ^ Perry, Richard (1973-11-30). "A History of Satellite Reconnaissance Volume IIIb - HEXAGON" (PDF). HQ Air Force Special Projects Production Facility. ^ "National Reconnaissance Office Review and Redaction Guide: Version 1.0 2015 Edition" (PDF). NRO. 2017-06-20. ^ Frederick L. Hofmann (1971-11-24). "KENNEN Memo: Birth of a BYEMAN Codeword" (PDF). NRO. ^ "NRO review and redaction guide (2006 ed.)" (PDF). National Reconnaissance Office. ^ a b Iannotta, Ben (2 June 2009). "Spy-sat rescue: Obama's proposal to prevent a gap in coverage sparks debate, optimism". Defense News. ^ a b "10 Who Made a Difference in Space: Bruce Carlson, NRO Director" (PDF). Space News / NRO. 7 September 2011. Archived from the original (PDF) on 29 September 2011. Retrieved 8 September 2011. ^ Warren Ferster. "Donated space telescopes are leftover spy program failures". MSNBC. ^ Zach Rosenberg. "NRO donates spare telescopes to NASA". FlightGlobal. ^ a b Achenbach, Joel (4 June 2012). "NASA gets two military spy telescopes for astronomy". Washington Post. ^ a b Overbye, Dennis (4 June 2012). "Former Spy Telescope May Explore Secrets of Dark Energy". New York Times. ^ Mark Wade (9 August 2003). "KH-11". Encyclopedia Astronautica. Archived from the original on 20 June 2012. Retrieved 23 April 2004. ^ a b Bamford, James (13 January 1985). "America's super secret eyes in space". NY Times. ^ Sharp, David (21 February 2019). "Evolved Expendable Launch Vehicle (EELV) Phase 2 Launch Service Procurement (LSP) Draft Request for Proposals (dRFP)". FedBizOpps.gov. ^ Day, Dwayne A. (7 February 2011). "The flight of the Big Bird (part 2)". The Space Review. ^ Tenet, George J. (27 September 2000). "DCI Remarks at the NRO 40th Anniversary Gala". CIA. ^ Charles P. Vick (25 April 2007). "KH-12 Improved Crystal". GlobalSecurity.org. ^ "HEXAGON (KH-9) mapping camera program and evolution" (PDF). National Reconnaissance Office. 1982-12-31. ^ a b "U.S. Costs of Verification and Compliance Under Pending Arms Treaties (CBO Publication #528)" (PDF). CONGRESSIONAL BUDGET OFFICE, CONGRESS OF THE UNITED STATES. September 1990. ^ Day, Dwayne A. (26 February 2018). "Shadow dancing: the Satellite Data System". The Space Review. ^ Fried, D. L. (October 1966). "Optical Resolution Through a Randomly Inhomogeneous Medium for Very Long and Very Short Exposures". Journal of the Optical Society of America. 56 (10): 1372–1379. Bibcode:1966JOSA...56.1372F. doi:10.1364/JOSA.56.001372. ^ Stoll, Clifford (1989). The Cuckoo's Egg. Doubleday. pp. 320–321. ISBN 978-0-307-81942-0. ^ Dressler, Alan (4 June 2012). "The NRO-1 2.4-m Telescope" (PDF). The National Academies. ^ Day, Dwayne (22 June 2009). "Gum in the Keyhole". The Space Review. ^ a b c Graham, William (20 January 2011). "Delta IV Heavy launches on debut West Coast launch with NRO L-49". nasaspaceflight.com. Retrieved 21 January 2011. ^ a b c d Vick, Charles P. (24 April 2007). "KH-11 KENNAN: RECONNAISSANCE IMAGING SPACECRAFT". globalsecurity.org. ^ Richelson, Jeffrey T. (14 April 1999). "National Security Archive Electronic Briefing Book No. 13: U.S. Satellite Imagery, 1960–1999". National Security Archive. ^ "KH-11 Recons Modified". Aviation Week. 9 October 1995. Archived from the original on 26 June 2010. ^ Molczan, Ted (8 December 2018). "NROL-71 payload speculation". satobs.org. ^ Ray, Justin (28 July 2016). "Spy satellite infrastructure supported by successful Atlas 5 rocket launch". Spaceflight Now. ^ Ferster, Warren (20 October 2009). "U.S. Intelligence Official Drops Hint About Next-Gen Spy Sat Capability". spacenews.com. ^ Mortari, Daniele (7 December 2018). "On Sun-Synchronous Orbits and Associated Constellations" (PDF). cranfield.ac.uk. ^ Molczan, Ted (7 December 2018). "NROL-71 search elements revised". satobs.org. ^ Graham, William (7 December 2018). "ULA Delta IV-Heavy launch with NROL-71 scrubbed". nasaspaceflight.com. ^ "Encyclopedia Astronautica – Misty". Astronautix.com. Archived from the original on 29 November 2010. Retrieved 3 December 2013. ^ Patrick Radden Keefe (February 2006). "I Spy". Wired. ^ "The Kampiles Case". JonathanPollard.org. Retrieved 30 December 2010. ^ "Record of William Peter Kampiles". Inmate Locator. Federal Bureau of Prisons. Retrieved 30 December 2010. ^ Vick, Charles P. (25 April 2007). "IMPROVED – ADVANCED CRYSTAL / IKON / 'KH-12'". globalsecurity.org. ^ a b c Molczan, Ted (13 July 2009). "KH-11 Lifetime" (PDF). satobs.org. ^ Langbroek, Marco (9 September 2013). "The orbit of USA 245 and the current KH-11 constellation". SatTrackCam Leiden. ^ a b Langbroek, Marco (13 September 2013). "On USA 245 and USA 129, and the future of the Keyhole constellation: an afterthought to my previous post". SatTrackCam Leiden. ^ Langbroek, Marco (16 September 2013). "Past and future of the KH-11 Keyhole/Evolved Enhanced CRYSTAL constellation (part 3)". SatTrackCam Leiden. ^ "1976-125A". Nssdc.gsfc.nasa.gov. 2013-08-16. Retrieved 2013-12-03. ^ "1978-060A". Nssdc.gsfc.nasa.gov. 2013-08-16. Retrieved 2013-12-03. ^ "1980-010A". Nssdc.gsfc.nasa.gov. 2013-08-16. Retrieved 2013-12-03. ^ "1981-085A". Nssdc.gsfc.nasa.gov. 2013-08-16. Retrieved 2013-12-03. ^ "1982-111A". Nssdc.gsfc.nasa.gov. 2013-08-16. Retrieved 2013-12-03. ^ "1984-122A". Nssdc.gsfc.nasa.gov. 2013-08-16. Retrieved 2013-12-03. ^ "1987-090A". Nssdc.gsfc.nasa.gov. 2013-08-16. Retrieved 2013-12-03. ^ "1988-099A". Nssdc.gsfc.nasa.gov. 2013-08-16. Retrieved 2013-12-03. ^ "1992-083A". Nssdc.gsfc.nasa.gov. 2013-08-16. Retrieved 2013-12-03. ^ "USA 86 – Orbit Data". heavens-above.com. 23 May 2002. ^ "1995-066A". Nssdc.gsfc.nasa.gov. 2013-08-16. Retrieved 2013-12-03. ^ "1996-072A". Nssdc.gsfc.nasa.gov. 2013-08-16. Retrieved 2013-12-03. ^ "USA 129 – Orbit Data". heavens-above.com. 19 February 2011. ^ "USA 224 recovered, USA 186 still drifting, and looking for GPS IIF-6 20 minutes after launch". Marco Langbroek. 2014-05-21. Retrieved 2016-05-13. ^ "2001-044A". Nssdc.gsfc.nasa.gov. Retrieved 2013-12-03. ^ "USA 161 – Orbit Data". heavens-above.com. 15 October 2010. ^ "USA 224 recovered: an update of the KH-11 constellation". Marco Langbroek. 2016-06-30. Retrieved 2019-02-11. ^ "2005-042A". Nssdc.gsfc.nasa.gov. Retrieved 2013-12-03. ^ "USA 186 – Orbit Data". heavens-above.com. 4 March 2019. ^ "2011-002A". Nssdc.gsfc.nasa.gov. Retrieved 2013-12-03. ^ "USA 224 – Orbit Data". heavens-above.com. 4 February 2011. ^ "2013-043A". Nssdc.gsfc.nasa.gov. Retrieved 2014-04-03. ^ "USA 245 – Orbit Data". heavens-above.com. 22 September 2013. ^ "2019-004A". Nssdc.gsfc.nasa.gov. Retrieved 2019-02-03. ^ "USA 290 – Orbit Data". heavens-above.com. 3 February 2019. ^ Molczan, Ted (4 December 2002). "Examples of other 'fake space' claims by governments?". fas.org. ^ "Never Before Seen View of a Keyhole Satellites?". Space Safety Magazine. 2013-09-26. Retrieved 2013-10-08. ^ O'Rourke, Ronald (25 May 2005). "Navy CVN-21 Aircraft Carrier Program: Background and Issues for Congress". Naval Historical Center. Archived from the original on 1 December 2006. ^ "Dr. Darrell Zimbelman Receives 2014 Charyk Award, Release # 02-14" (PDF). National Reconnaissance Office. 8 April 2014. Archived from the original (PDF) on 19 January 2017. Retrieved 17 April 2014. John Pike (2000-09-07). program. Federation of American Scientists. Retrieved 2008-02-23. John Pike (1 January 1997). KH-11 product. Federation of American Scientists. Retrieved 24 April 2004. John Pike (9 September 2000). KH-12 Improved Crystal. Federation of American Scientists. Retrieved 23 April 2004. John Pike (22 August 1998). KH-12 product. Federation of American Scientists. Retrieved 23 April 2004. Mark Wade (9 August 2003). KH-11. Encyclopedia Astronautica. Retrieved 23 April 2004. This page was last edited on 14 March 2019, at 20:58 (UTC).